Class of 2016 valedictorian, Krista has been active in both volleyball and basketball all four years as well as being recognized on the all-academic teams each year. 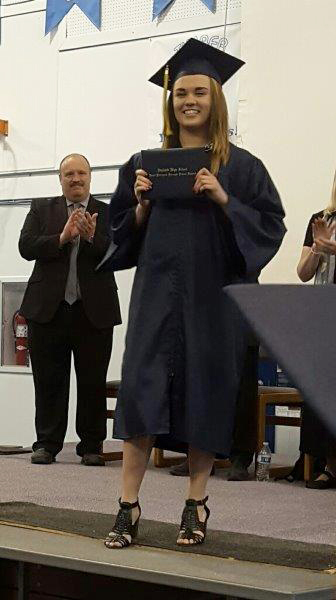 She graduates with a 4.0 GPA and 21 college credits through Kenai Peninsula College utilizing the KPB Jump Start program. Krista earned the UA Scholar Scholarship, the Alaska Performance Scholarship and was awarded the first year tuition waiver at Kenai Peninsula College (KPC). She also participated in student council, honor choir, and the Close-Up program. In the community she has participated in 4-H, the Native Youth Olympics, and has volunteered in several activities at the Kenai Peninsula Fair Grounds. Krista will attend KPC next year and plans to major in Psychology. Her plans are to pursue a Bachelor of Science in Criminal Justice, eventually transferring to the University of Oklahoma with the goal of graduating from the OU College of Law. This entry was posted on June 21, 2016 at 1:55 pm. You can follow any responses to this entry through the RSS 2.0 feed. You can skip to the end and leave a response. Pinging is currently not allowed.